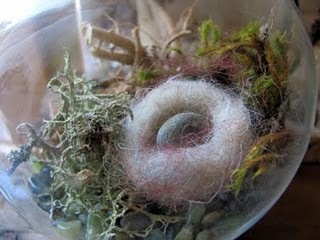 I'm a bigger knitter in addition to terrarium-enthusiast. There is something magic about working with a special yarn and knitting it up to a whole new item. It's almost a surprise every time - much like the end result of a fully grown terrarium always looks a little different than you expected. I fell in love with this novel combo: felt and plants.